When should I consider using ultrasonics to cut my food product? Ultrasonic food processing involves a vibrating knife producing a nearly frictionless surface to which food products do not stick nor deform. 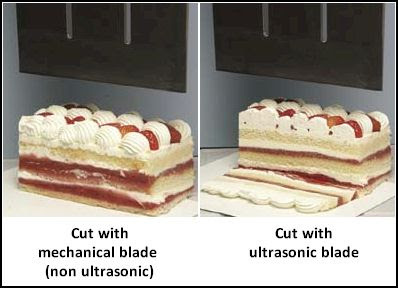 Here are some things to consider when deciding if ultrasonic cutting is the right process for your application. Is your product sticky and causing excessive downtime for blade cleaning? Does your current cutting process smear multiple layers causing a visually unappealing product? Does your current process cause the product to crumble and decrease your yield? Does your current process crush the product during the cut? If you answered yes to any of the above, chances are ultrasonics can improve your process, if you answered no to all the questions your current method is acceptable. 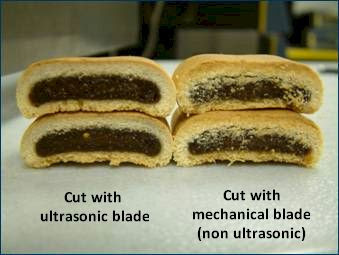 Below are some pictures that illustrate the quality of cut with ultrasonics. Here is an ultrasonic blade horn in action. See Dukane’s Food Processing FAQ page for more information.